The Congressional Budget Office just released it’s annual Budget and Economic Outlook, and that means I’m going to do something that I first did in 2010 and most recently did last year. 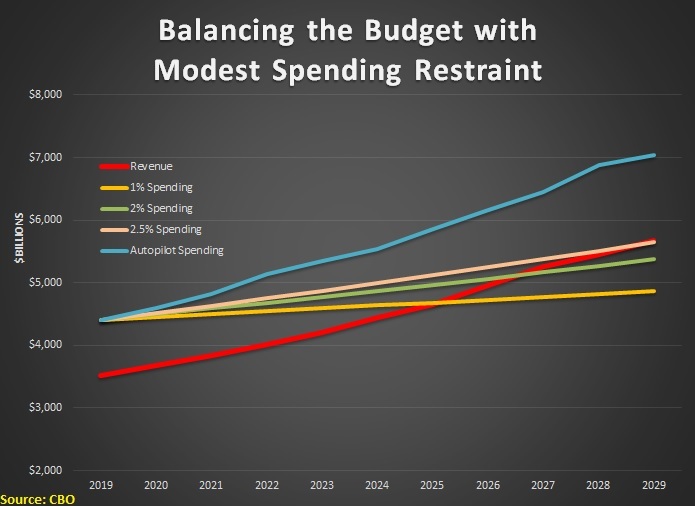 I’m going to show that it’s actually rather simple to balance the budget with modest spending restraint. This statement shocks many people because they’ve read about out-of-control entitlement spending, pork-filled appropriations bills, big tax cuts, and trillion-dollar deficits. 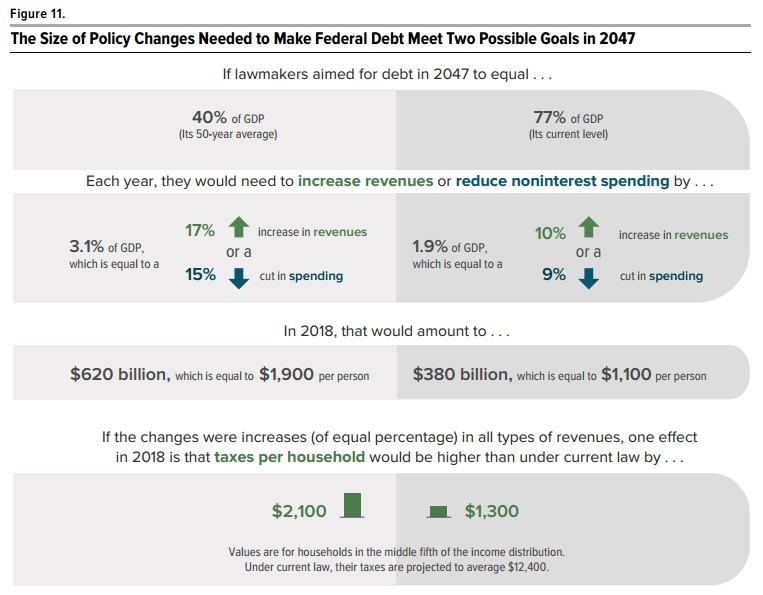 But the first thing to understand when contemplating how to fix America’s fiscal problems is that tax revenues, according to the new CBO numbers, are going to increase by an average of nearly 5 percent annually over the next 10 years. And that means receipts will be more than $2.1 trillion higher in 2029 than they are in 2019. By the way, I don’t even think balance should be the goal. 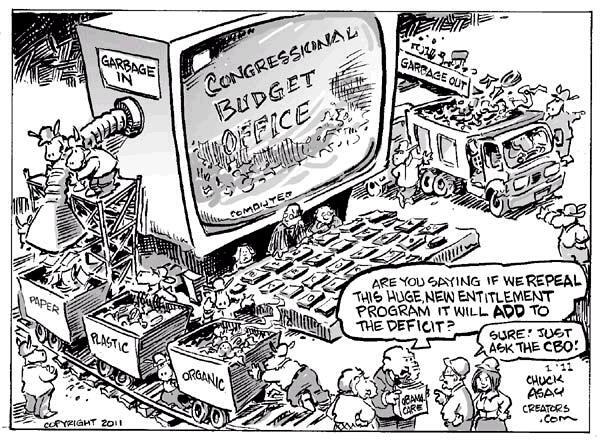 It’s far more important to focus on reducing the burden of government spending. After all, the economy is adversely affected if wasteful outlays are financed by taxes, just as the economy is hurt when wasteful outlays are financed by borrowing. In other words, too much government spending is the disease. Deficits are best understood as a symptom of the disease. But I’m digressing. The point for today is simply that the symptom of borrowing can be addressed if a good chunk of that additional $2.1 trillion of new revenue is used to get rid of the $897 billion of red ink. I’ll close with a video from 2010 that explains why spending restraint is the best way to achieve fiscal balance. Especially when compared to tax increases. The numbers are different today, but the analysis hasn’t changed. As I noted at the end of the video, balancing the budget with spending restraint may be simple, but it won’t be easy. P.S. The video also exposed the dishonest way that budgets are presented in Washington. 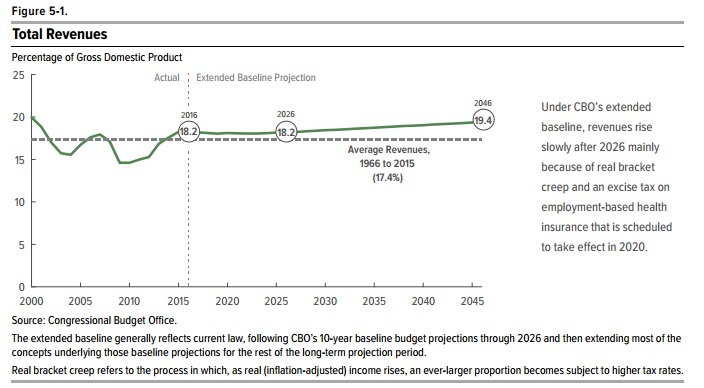 The Congressional Budget Office has just released the 2016 version of its Long-Term Budget Outlook. It’s filled with all sorts of interesting data if you’re a budget wonk (and a bit of sloppy analysis if you’re an economist). If you’re a normal person and don’t want to wade through 118 pages, you’ll be happy to know I’ve taken on that task. And I’ve grabbed the six most important images from the report. 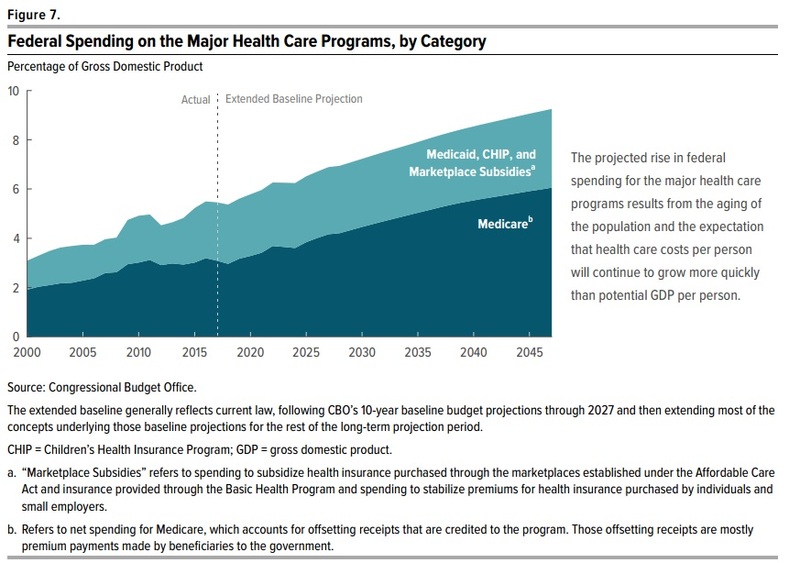 First, and most important, we have a very important admission from CBO that the long-run issue of ever-rising red ink is completely the result of spending growing too fast. I’ve helpfully underlined that portion of Figure 1-2. And if you want to know the underlying details, here’s Figure 1-4 from the report. Once again, since I’m a thoughtful person, I’ve highlighted the most important portions. 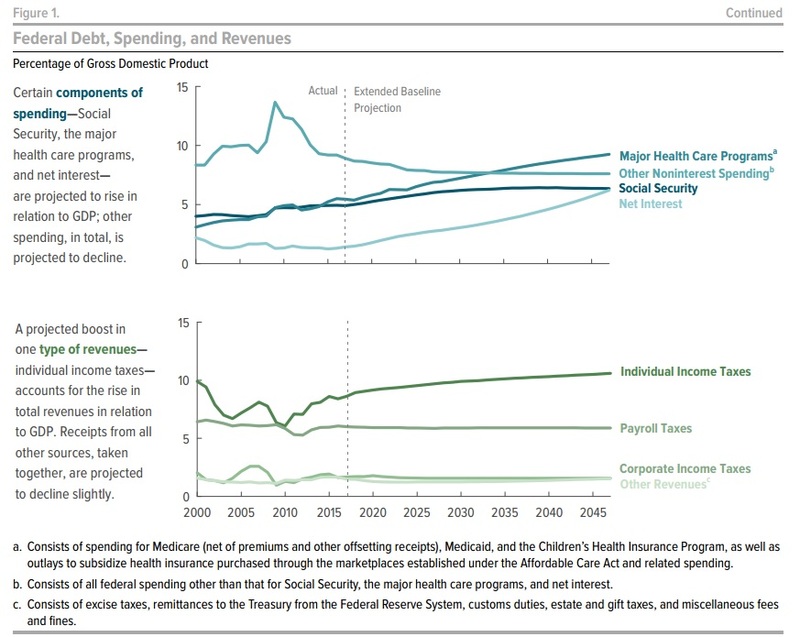 On the left side of Figure 1-4, you’ll see that the health entitlements are the main problem, growing so fast that they outpace even the rapid growth of income taxation. 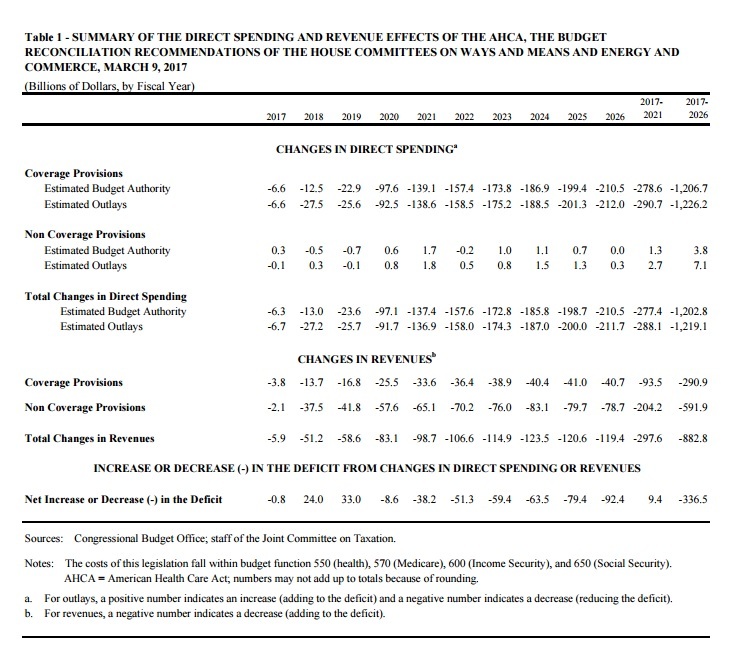 And on the right side, you’ll see confirmation that our fiscal challenge is the growing burden of federal spending, exacerbated by a rising tax burden. 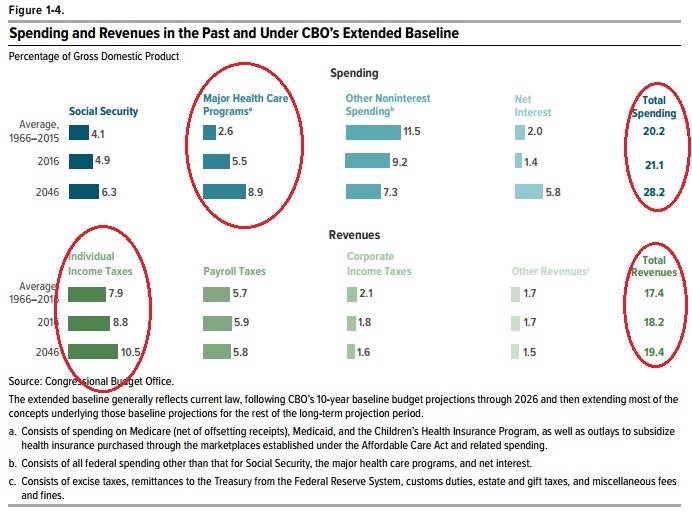 And if you want more detail on health spending, Figure 3-3 confirms what every sensible person suspected, which is that Obamacare did not flatten the cost curve of health spending. 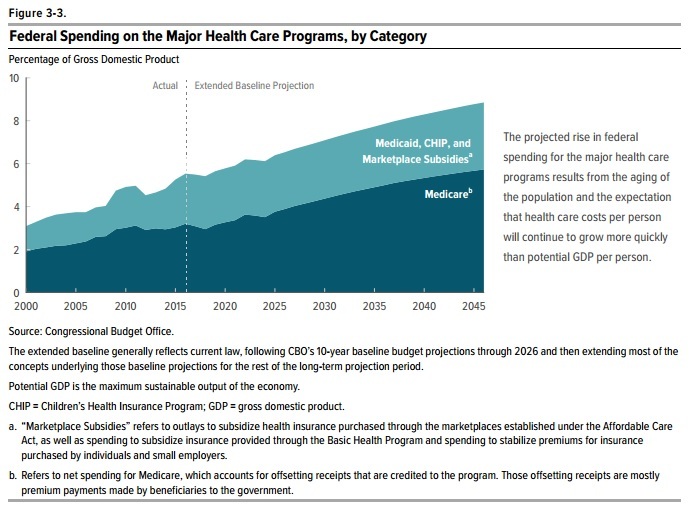 Medicare, Medicaid, Obamacare, and other government health entitlements are projected to consume ever-larger chunks of economic output. Now let’s turn to the revenue side of the budget. 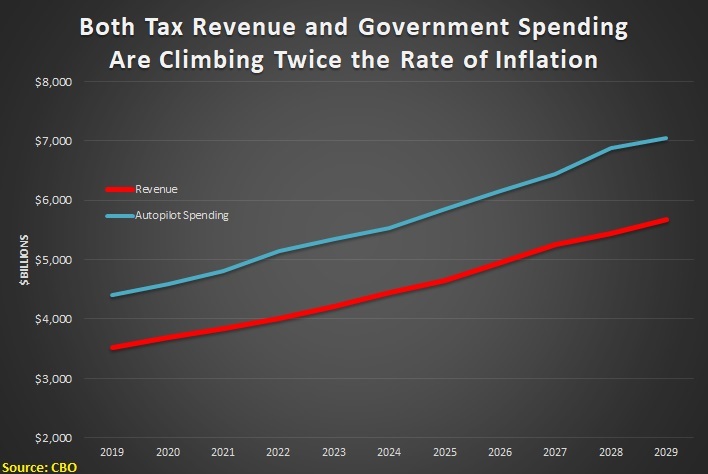 Figure 5-1 is important because it shows that the tax burden will automatically climb, even without any of the class-warfare tax hikes advocated by Hillary Clinton. And what this also means is that more than 100 percent of our long-run fiscal challenge is caused by excessive government spending (and the Obama White House also has confessed this is true). Let’s close with two additional charts. We’ll start with Figure 8-1, which shows that things are getting worse rather than better. 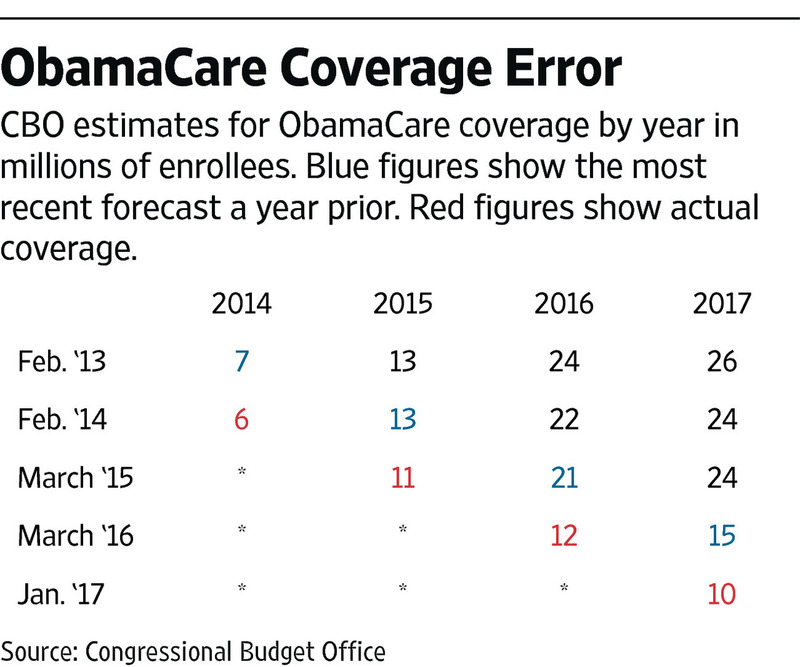 This year’s forecast shows a big jump in long-run red ink. 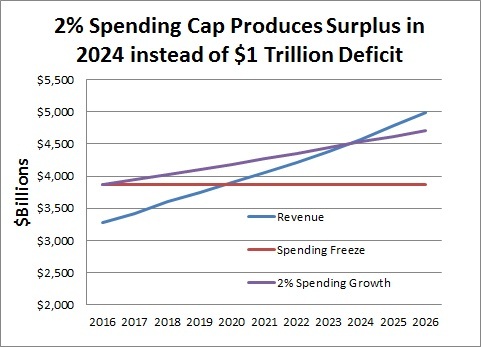 There are several reasons for this deterioration, including sub-par economic performance, failure to comply with spending caps, and adoption of new fiscal burdens. The bottom line is that we’re becoming more like Greece at a faster pace. 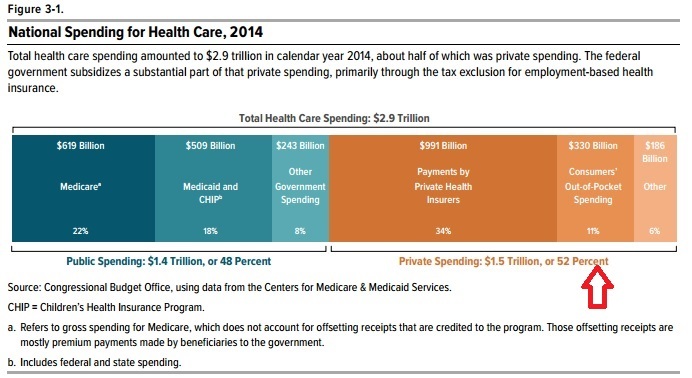 Last but not least, here’s a chart that underscores why our healthcare system is such a mess. 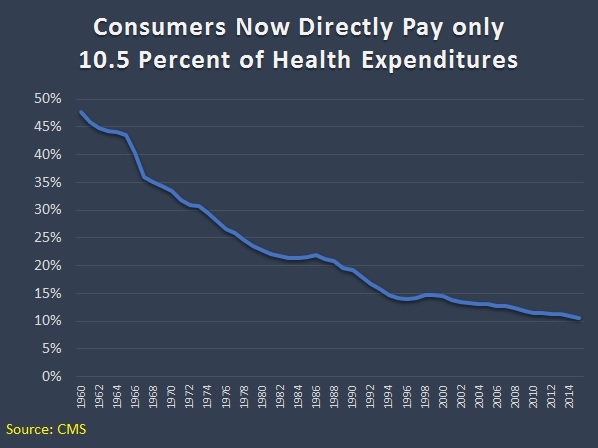 Figure 3-1 shows that consumers directly finance only 11 percent of their health care, which is rather compelling evidence that we have a massive government-created third-party payer problem in that sector of our economy. 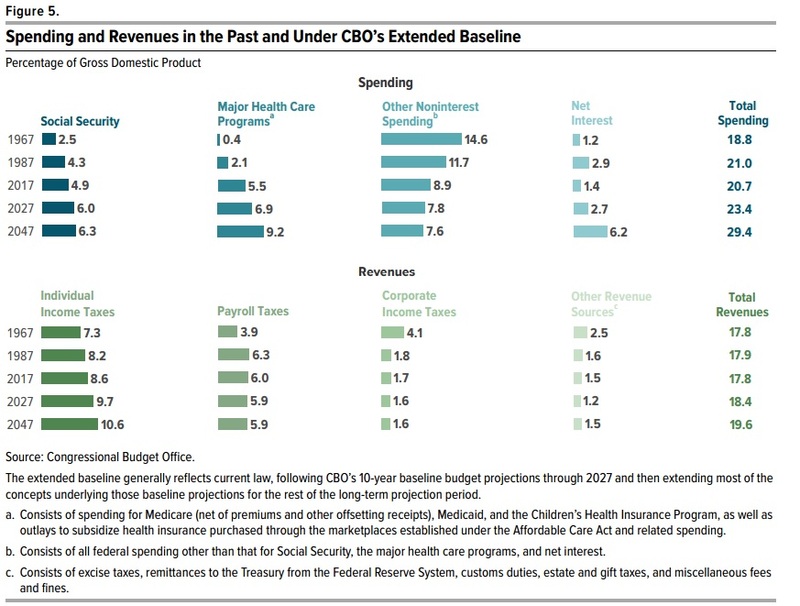 Yes, this is primarily a healthcare issue, especially if you look at the economic consequences, but it’s also a fiscal issue since nearly half of all health spending is by the government. P.S. If these charts aren’t sufficiently depressing, just imagine what they will look like in four years. 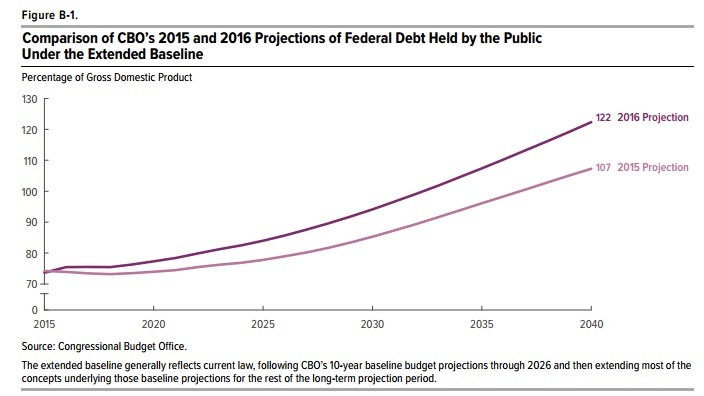 The Congressional Budget Office has just released its new 10-year fiscal forecast and the numbers are getting worse. 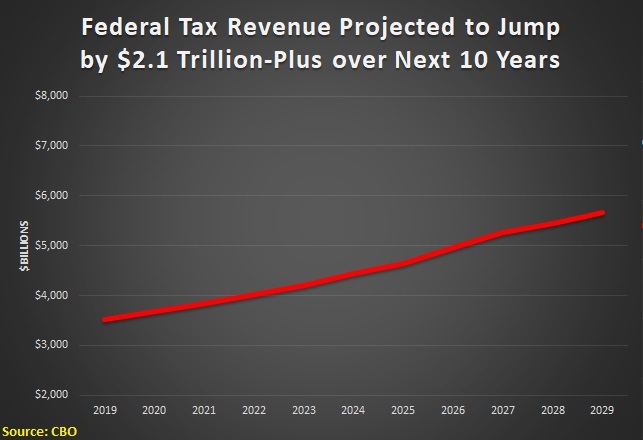 Most people are focusing on the fact that the deficit is rising rather than falling and that annual government borrowing will again climb above $1 trillion by 2022. This isn’t good news, of course, but it’s a mistake to focus on the symptom of red ink rather than the underlying disease of excessive spending. So here’s the really bad news in the report. 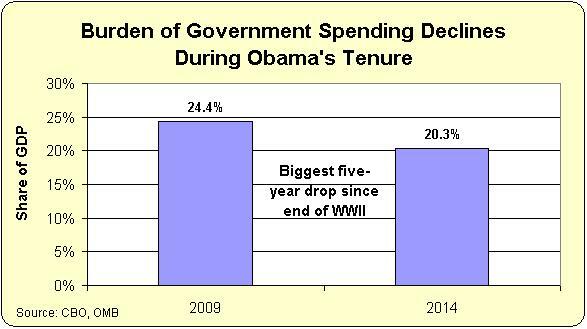 The burden of government spending has jumped from 20.3 percent of GDP in 2014 to 21.2 percent this year. By the end of the 10-year forecast, the federal government will consume 23.1 percent of the economy’s output. In other words, the progress that was achieved between 2010 and 2014 is evaporating and America is on the path to becoming a Greek-style welfare state. There are two obvious reasons for this dismal trend. Notwithstanding laughable claims from the White House, Obamacare is contributing to rising spending on healthcare entitlements. Republicans keep capitulating on the BCA spending caps, enabling more wasteful outlays for so-called discretionary programs. Here’s a chart that shows what’s been happening. It shows the rolling average of annual changes in revenue and spending. 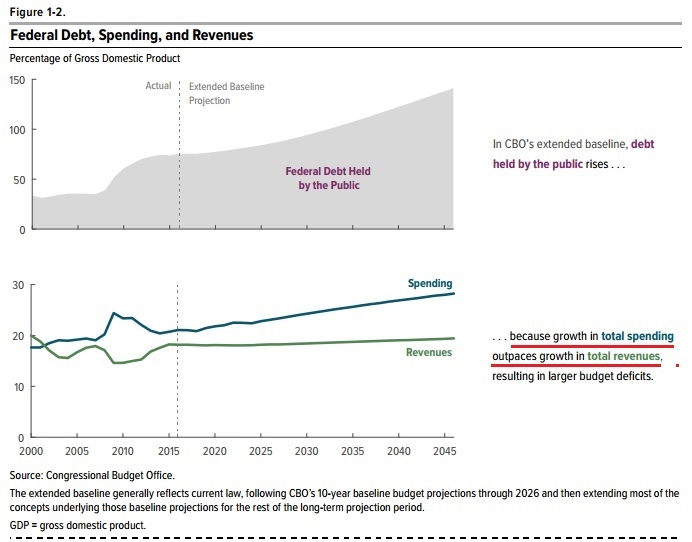 With responsible fiscal policy, the red line (spending) will be close to 0% and have no upward trend. 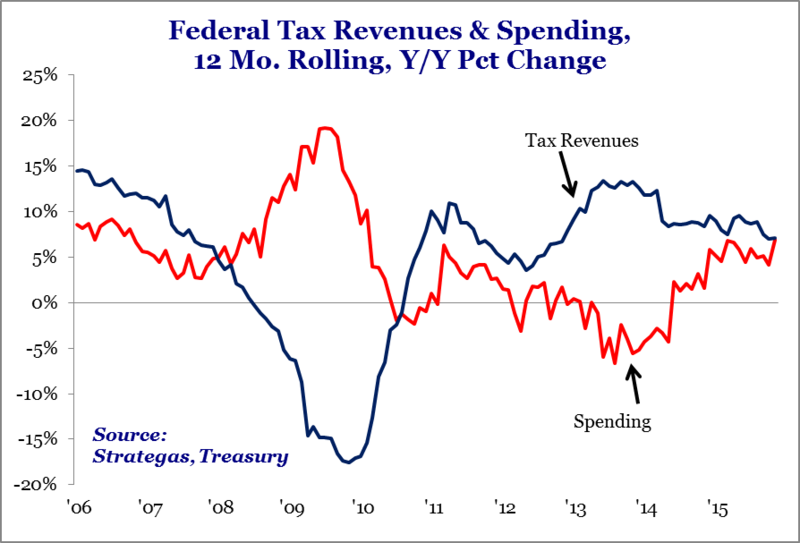 Unfortunately, federal outlays have been moving in the wrong direction since 2014 and government spending is now growing twice as fast as inflation. By the way, don’t forget that we’re at the very start of the looming tsunami of retiring baby boomers, so this should be the time when spending restraint is relatively easy. Yet if you’ll allow me to mix metaphors, bipartisan profligacy is digging a deeper hole as we get closer to an entitlement cliff. Now let’s shift to the good news. It’s actually relatively simple to solve the problem. 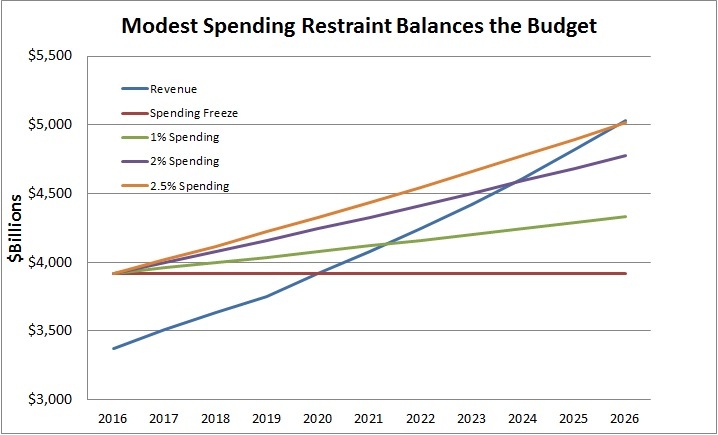 Here’s a chart that shows projected revenues (blue line) and various measures of how quickly the budget can be balanced with a modest bit of spending restraint. Regular readers know I don’t fixate on fiscal balance. I’m far more concerned with reducing the burden of government spending relative to the private sector. That being said, when you impose some restraint on the spending side of the fiscal ledger, you automatically solve the symptom of deficits. 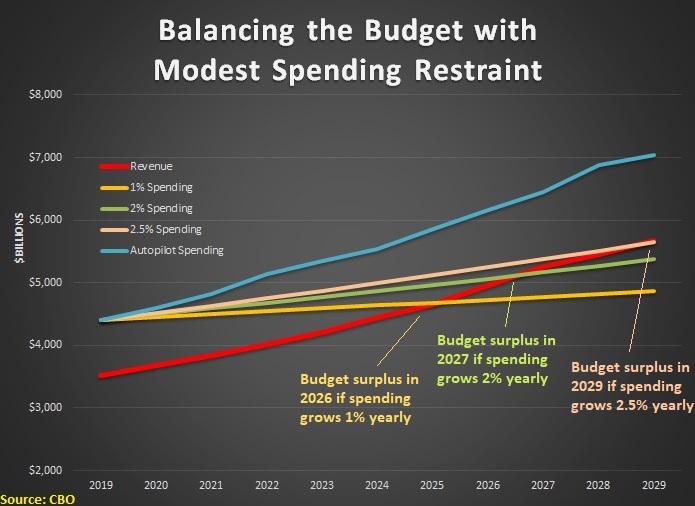 With a spending freeze, the budget is balanced in 2020. 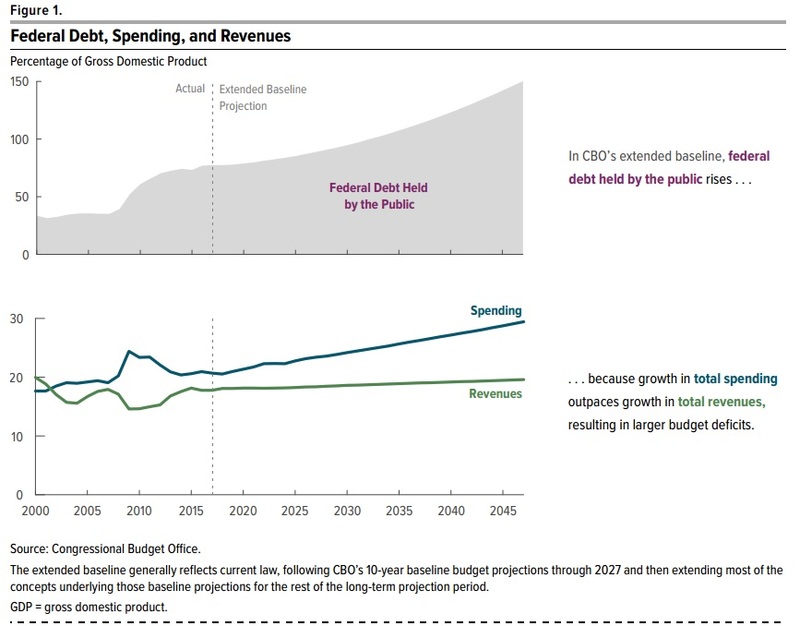 If spending is allowed to climb 1 percent annually, the deficit disappears in 2022. And if outlays climb 2 percent annually (about the rate of inflation), the budget is balanced in 2024. 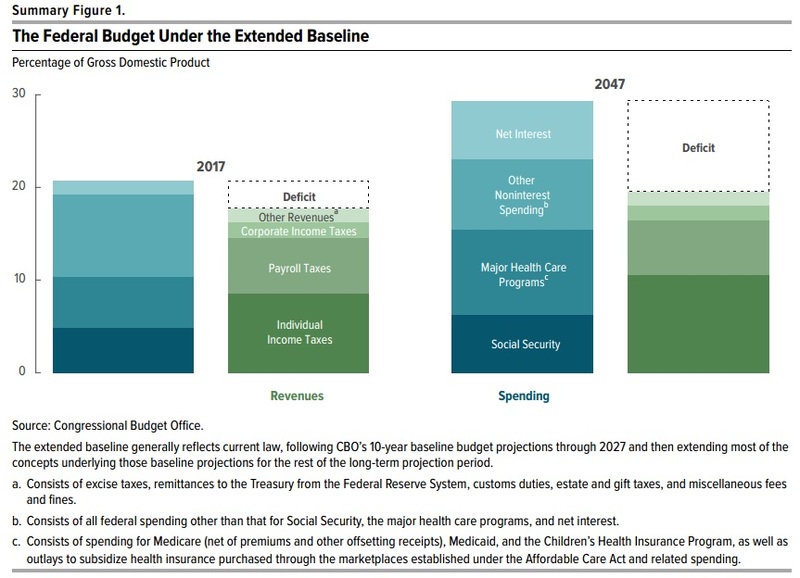 And if you want to give the politicians a 10-year window, you get to balance by 2026 if spending is “only” allowed to grow 2.5 percent per year. In other words, the solution is a spending cap. 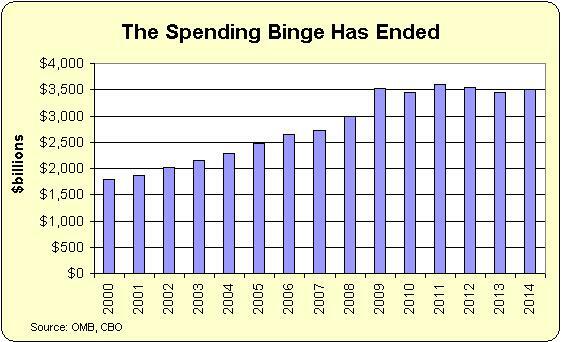 Here’s my video on spending restraint and fiscal balance from 2010. The numbers obviously have changed, but the message is still the same because good policy never goes out of style. Needless to say, a simple solution isn’t the same as an easy solution. The various interest groups in Washington will team up with bureaucrats, politicians, and lobbyists to resist spending restraint. P.S. A final snow update. Since my neighbors were kind enough to help me finish my driveway yesterday, I was inspired to “pay it forward” by helping to clear an older couple’s driveway this morning (not that I was much help since another neighbor brought a tractor with a plow). It’s amazing that these good things happen without some government authority directing things!